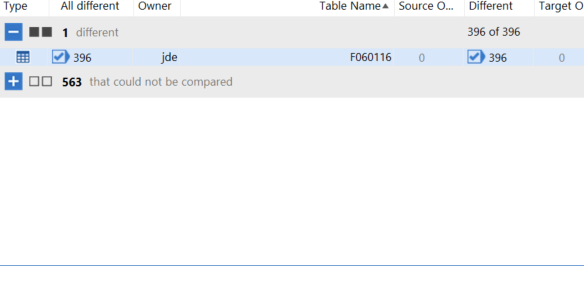 The SQL Data Compare results showing differences are supposed to show the two columns being compared adjacent to each other. Sometimes the columns are not adjacent to each other, making it hard to use the interface. The initial display seems to start as adjacent, but some bug appears to be causing the position to switch after going to different views, then going back to the “in both but different” view. The relative positions keep shifting when this happens. Column srcA and dstA might start out as being at columns 1 and 2 in the results. Then dstA moves to column 3, then dstA moves to column 4, while srcA stays at column 1. Can you show us an example of what you're seeing? What o/s, and what screen resolution/dpi are you using? I have not seen the bug in the past few days. I turned off the inclusion of identical rows, which may have impacted it. Windows 10 Enterprise 10.0.17134 Build 17134. 1920x1080 connected through a ThinkPad USB-C dock. I switched to a different project and the problem showed up again. This other project has the include identical rows option enabled. In the attached screenshot, all the dark blue shaded row pairs should be adjacent. The other bug I am seeing is that often the window showing the actual rows does not appear.